Source: Concierge Medicine Today/The DPC Journal — On the eve of the FORUM in Atlanta [Thursday night, Oct. 26, 2017], a leadership dinner was held to have an open dialogue with industry leaders in the space. Dr. Jeanette McCarthy, MPH, PhD is a CMT Faculty/Speaker in Atlanta (photo: last Oct. 2017). She is a gifted presenter, speaker and Duke/UCSF Faculty. She will be in Greenwich, CT this April 21-22, 2018. Our 2018 CMT FOR DOCTORS FORUM in ATL. Dates are Oct. 26-27, 2018. Plan to attend BOTH events and invite your colleagues to learn about Precision Medicine! 2017 CMT FORUM in ATL. | Concierge Doctor, Ellie Campbell (left) and Natalie Patierno (right) pictured were speakers at the national/international gathering of Physicians. 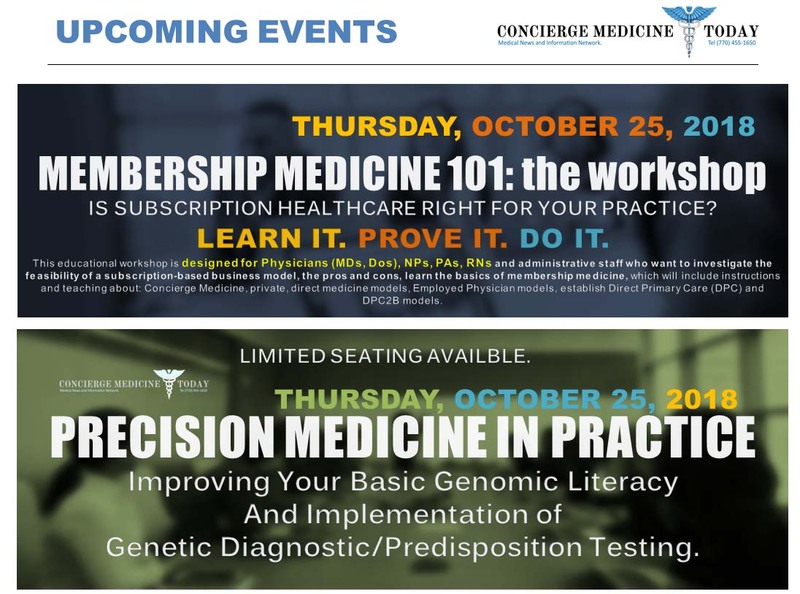 Concierge Medicine Today, in partnership with The Direct Primary Care Journal (The DPC Journal), is hosting a 2-day innovative healthcare delivery and precision medicine forum in Atlanta, GA on Friday, October 26 and Saturday, October 27, 2018 entitled CMT’s 2018 Concierge Medicine Forum. In addition to serving as a “think tank” for the personalized medicine industry in uncovering emerging trends that could improve the lives of today’s physicians and their patients, the two-day forum will also address current trends that are having an impact on the quality of health care today. Bringing together leaders from such major healthcare, technology, Concierge Medicine and Precision Medicine brands including: Boston Heart Diagnostics Corporation; Evidenza Precision Medicine; Doctors Evidence; Genome Medical; Phosphorus; the American College of Private Physicians (ACPP); AFFIRMATIVhealth and Alletess Medical Laboratory among other innovators in healthcare, to present about emerging trends that are helping to reshape healthcare in the personalized medicine industry. Join Physician, RNs, FNPs, PAs and Healthcare Professionals From Around the U.S., the United Kingdom and South America for the 2018 CMT Concierge Medicine FORUM this OCTOBER 26-27, 2018 — Nearly 30 Speakers, Physicians and Faculty In 2-Days! Speakers at the 2018 CMT Concierge Medicine Forum in Atlanta include: Keynote speaker, bestselling author and CEO-founder of engagedIN, a neuroscience-based design firm, Dr. Kyra Bobinet; Dr. Thomas N. Folan, Board-Certified Radiologist in the Health Nucleus at Human Longevity (HLI); Dr. Todd Feinman, Advisory Board Member with Evidenza Precision Medicine and Chief Medical Officer and co-founder of Doctors Evidence; Marni Jameson Carey, MA, Executive Director, Association of Independent Doctors (AID); Anish Anil Patel, M.D., Scripps Coastal Medcal Group & Emergency Physicians/Vituity; James J. Eischen, Jr., Esq., of McGlinchey Stafford LLP, a seasoned health care attorney within the firm’s Health Care and Business Transactions practice groups; Jeanette McCarthy, PhD., Associate Professor at Duke University and The University of California San Francisco; Michele P. Madison, Esq., Partner, Morris, Manning & Martin, LLP; Caleb O’Neal, of SolaceMD and Research Associate at Human Longevity, Inc.; Dan Hecht, ​Professor of Leadership at Jack Welch Management Institute; Senior Advisor, MDVIP & Founder/CEO of CEOhm Emily Durham, M.S., Community Pharmacy Services & Compound Pharmacy Network Liaison; Dr. JOEL Bessmer, MD, FACP, Founder of Members.MD and the Owner & Medical Director & Medical Director at Strada Healthcare; Thomas LaGrelius, MD, Concierge Doctor, Family Physician | Skypark Preferred Family Care & Pilot/Aircraft Owner & President of The American College of Private Physicians (ACPP.md); David Bick, MD, is the chief medical officer and a faculty investigator at the HudsonAlpha Institute for Biotechnology, the medical director of The Smith Family Clinic for Genomic Medicine, LLC; Co-Presenters, Denise Kalos, President of AFFIRMATIVhealth and Ginger Schechter, MD, Board Certified Internal Medicine Physician and Lead Physician for the Re:Mind program, a precision medicine research based approach to early memory loss and Alzheimer’s treatment; Concierge Medicine Today and The Direct Primary Care Journal’s Editor and Publisher, Michael Tetreault and Catherine Sykes; as well as speakers from across the Concierge Medicine, Direct Primary Care and the Precision Medicine landscape. Concierge Medicine Today (CMT) is a news organization and the Concierge Medicine industry’s foremost national trade publication for the Concierge Medicine and Membership Medicine marketplaces. Its website is the online destination for businesses, consumers, physicians, legislators, researchers and other stakeholders to learn about the history of this industry, various business aspects of the marketplace, trends, breaking news and more that drives the conversation that Concierge Medicine and free market healthcare delivery is creating on a national and international level. *The Membership Medicine 101 Seminar is designed to guide inform and educate Doctors on the pros and cons associated with converting their practice to a membership model, the types of models and their structures, how to evaluate if their practice would thrive and other key considerations to evaluate whether a membership model will work for them. *The Precision Medicine In Practice seminar is designed to be a hands-on interactive workshop which will teach foundational concepts of clinical genomics and practical skills for implementing genetic diagnostic/predisposition testing for common diseases in medical practice. It is intended for health care professionals with little to no experience with genetic testing, who are interested in bringing precision medicine to their patients. The format includes lecture, group exercises and clinical case reviews. We’ll explore popular genetic tests for hereditary cancers and cardiovascular disease and learn how to choose the right test, select a testing lab, interpret lab reports and communicate with patients. In addition, we’ll review online tools and databases, and offer resources for learning about the genetic basis of diseases. You’ll walk away with the confidence to begin offering precision medicine in your clinical practice.